Don’t miss your chance to visit Premier Modular! Following the success of our event on modular and off-site construction in March, we are offering members the opportunity to visit Premier Modular‘s factory to see what it’s all about. The overall management and strategic direction of the Northern Housing Consortium is entrusted to the Board of Directors who are subject to election each year from Full Member organisations. Under the provisions of the Companies Acts and the Consortium’s Articles of Association, four Directors of the Board of Management are required to retire from office this year but are eligible to stand for re-election. Under the Consortium’s governance arrangements, all nominations for the position of Director will be reviewed by the Board (or their nominated representatives), against a Skills Matrix for Directors to ensure that they meet the Board’s requirement to fill any vacancies. You can find a copy of the Skills Matrix and Board Director Role Profile in the Board Director Nomination Pack below. The Board have confirmed their support for the re-election of the above candidates. If there are more successful nominations than vacancies available, a postal ballot will be arranged and the results announced for formal approval by the Full Members at the NHC’s Annual General Meeting on 10th November, 2016 in York. A nomination form is included in the Nomination Pack. Nominations of candidates should be made no later than 17th June 2016. Please note that you can nominate more than one candidate but please note the conditions for nominating candidates included in the Nomination Pack. The Northern Housing Consortium’s Commission for Housing the North has released it’s Interim Report. The interim report of the NHC Commission for Housing in the North sets out the findings from six months of evidence gathered from NHC members, wider stakeholders, partners and investors, all with in-depth knowledge and expertise of Northern housing markets. The report sets out the causes for optimism for housing in the North as it seeks to complement the potential of a vibrant Northern Powerhouse. It identifies a series of strengths the North possesses that can build upon – the Commission has heard persuasive evidence of latent investment drivers for the North, it has found the North can offer excellent returns on investment and can contribute significantly to the Government’s aspirations to drive up home ownership. The Commission is keen to continue to identify innovation across the North and to work with NHC members and partners to bring scale to these initiatives. The Commission now opens up to a period of consultation as we invite views on the findings to date as well as further evidence and insight to assist in shaping our recommendations which will form the basis of our final report in the Autumn. Northern Powerhouse Minister James Wharton said: “This Government is dedicated to rebalancing the economy through building a Northern Powerhouse. Support at local level will be absolutely key to this, just as it will be to our commitment to deliver one million homes. The Commission consultation period will run until the end of July 2016 and the NHC will be engaging with its members, parliamentarians, civil servants, stakeholders and wider partners during this period. Tunstall Healthcare (UK) Ltd has been awarded a place on our new framework for Technology Enabled Care Services. The framework covers aspects of Connected Care and Connected Health including environmental sensors, safety and security solutions, installation and maintenance, and monitoring centre solutions. The TECS framework runs for four years to November 2019, and provides a pre-approved, benchmarked and OJEU (Official Journal of the European Union) compliant route to market, for potential customers to procure goods and services. As the contracts were awarded under OJEU, Consortium Procurement members are able to call off products directly under the Products framework, streamlining the tendering process. Under the Services framework, customers specify their requirement and invite bids for the work by way of further competition. The awards follow a rigorous assessment to validate Tunstall’s financial standing, quality of offer and commercial offering, all of which are benchmarked against the market to demonstrate MEAT (Most Economically Advantageous Tender). Tunstall Healthcare Group offers a range of Connected Care and Connected Health solutions across each of its main regions – UK, Nordics, Southern Europe, Central Europe, North America and Asia-Pacific. Through the use of smart technology underpinned by high quality, high touch services we support older people and those with long term needs to live as independently, securely, healthily and happily as they are able. As the market leading provider of technology-enabled care, we have been working with health, housing and social care partners for nearly 60 years. By effectively supporting health, independence and well-being, our Connected Care and Connected Health solutions improve outcomes and deliver efficiencies when compared to traditional models of hospital or residence-based care. As we’ve previously announced, we are working in partnership with HACT (Ideas and innovation in housing) on the development of a new Social Value procurement project. To support us with this, we would welcome any case studies and examples of good practice within your organisation you would like to share with us on how you have successfully included social value within your contracts with NHC (and Consortium Procurement). We are willing to create branded case study promotional literature which you could use to promote the services that your organisation provides. This new project intends to bridge the gap between the requirements of the social housing sector, public bodies and other housing organisations by drawing on our own experience of innovating in social impact measurement. We will be looking to create a toolkit as a part of this project that includes checklists, guidance and best practice examples of how to include social value in your procurement process. If you would like to be involved in this please contact Louise Chase on 0191 566 1026 by Thursday 12th May. On 8th Feburary 2016, the Government published the final local government finance settlement: England, 2016 to 2017, the annual determination of funding to local government. As well as setting out the Settlement to local authorities for 2016/17, this year an indicative Settlement has been published for councils up to 2019/20. The Northern Housing Consortium has undertaken an analysis of this and previous years’ Settlements and produced a briefing on how Settlement has changed over a ten-year period, comparing the latest to that of 2016/17. The briefing can be found on the NHC website here. Following a consultation published in December 2015 on the provisional Settlement, the Department for Communities and Local Government (DCLG) published the final local government finance Settlement: England, 2016 to 2017, the annual determination of funding to local government, on 8 February 2016. This briefing is designed to provide Northern Housing Consortium members with information on how the LG Settlement has changed over the ten year period from 2006/07 to the 2016/17 financial year. The indicative Settlements up to the end of the current parliament (2019/20) will also be explored. The data in this briefing will not include an analysis of allocations to Fire Authorities, rather allocations to upper and lower tier councils are analysed. As the analysis explores different local authority types dating prior to the local authority restructure of 2009, a 2006/07 proxy for the new unitary authorities was created by aggregating former district and a proportion of shire county grants. The total value of grants to local authorities in England was £17,966million. Services are divided into five groups reflecting the division of responsibilities for providing services in some non-metropolitan areas: some services are provided predominantly by district councils (‘lower-tier services’), others by county councils (‘upper-tier services’), and others by fire and rescue authorities (‘fire and rescue services’). The fourth group of services covers those services other than policing services and fire and rescue services provided by the Greater London Authority and its functional bodies. The fifth group of services covers the notional policing element of the council tax freeze grant legacy payments included within the Local Government Finance Settlement. Different percentage reductions to core funding are applied to each group of services, reflecting the pressures on those services. The upper-tier element is calculated for the following classes of authority: non-metropolitan district councils which have the functions of county councils, county councils, London borough councils, Common Council of the City of London and metropolitan district councils. The final Settlement 2016/17 confirmed that core government funding to councils, Revenue Support Grant (RSG) would reduce by 28 per cent (£2.7 billion). Government proposed a new methodology for allocating reductions in RSG to take into account councils’ ability to raise income through council tax. 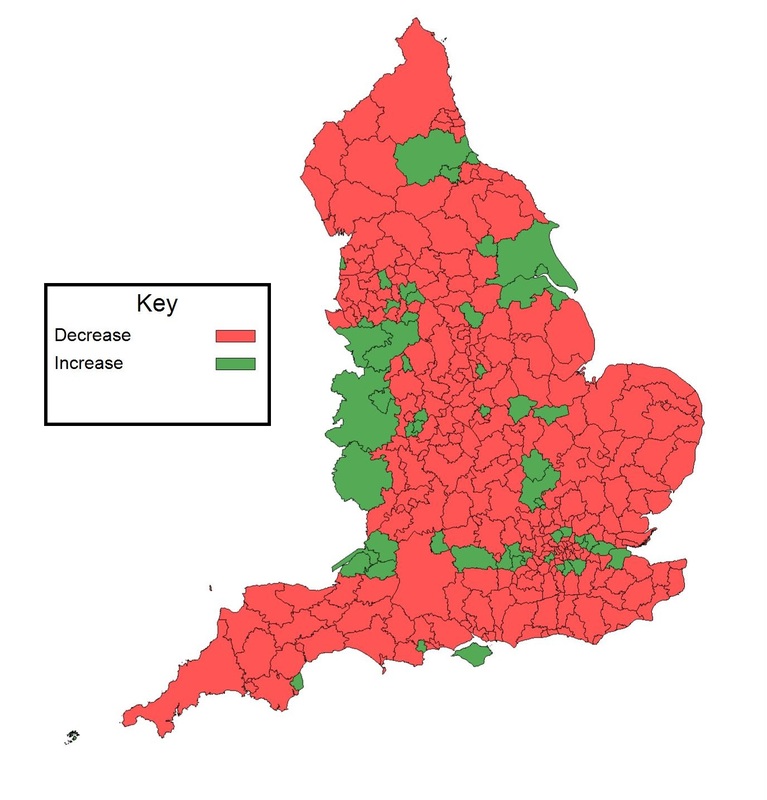 In effect, the new system now accounts for the differing extent to which councils rely on grants, locally retained business rates and council tax, making reductions smaller than they would otherwise have been to those that are more reliant on the grant as a proportion of their total income. As a result, local authorities able to raise more of their own revenue from council tax will receive bigger grant funding reductions than they would have received under the previous methodology. The Government has provided additional funding in the form of a transitional grant of £150 million in both 2016/17 and 2017/18 for councils that were most adversely affected by the change in the distribution of RSG. The reduction is based on an assumption by the Government that the council tax base will continue to grow at the same rate as it did from 2013/14 to 2015/16. New Homes Bonus will be outside this process and unchanged. The Secretary of State announced that he would conduct a review of needs. This will dovetail with the introduction of 100% business rates retention (which the Secretary of State strongly implied to be in 19/20) and could be used as a transition mechanism earlier. Recognising that council services in rural areas face extra costs, the Secretary of State proposed in the provisional Settlement that the Rural Services Delivery Grant (RSDG) should be increased from £15.5million to £20million in 2016 to 2017 and to £65million in 2019 to 2020. However, after the consultation period, the RSDG is to increase to £80.5m in 2016/17. The total value of the Settlement coming to the three northern regions is £5,470.64million. This equates to 30.4% of the total England figure. Notwithstanding this, the North East, North West and Yorkshire and the Humber are three of only four regions that have seen a decrease in their Settlements on 2006/07 – London having seen a significant reduction in their grant. Yorkshire and the Humber (-3.8%) was the hardest hit of the northern regions, while the North East saw a reduction of 2.2% and the North West, 0.1%. In total, £97million was lost to the North over this period. In terms of regional share of the total Settlement, all regions outside London benefitted at London’s expense to a greater or lesser extent. London’s share fell by 4.9%. As table 2 shows, the South East benefitted most (+1.3%), whilst Yorkshire and the Humber’s share of the total Settlement grew by only 0.1%. Typically urban authorities derive a greater proportion of their funding from central grants due to having greater social and economic needs, and so receive larger sums of deprivation-targeted grants. It is perceived that county and district councils tend to have fewer deprived areas and so receive small amounts of grant. Table 3 below shows the level of grant for different authority type and how these compare with 2006/07 grants. The table shows that metropolitan authorities received the greatest proportion of the total grant (26.4%), followed by shire counties (22.7%) and unitary authorities (21.1%). The data also shows that the shire county allocation is the result of a significant increase on the 2006/07 figures. This is despite there being fewer shire counties post 2009. All other types of council with the exception of unitary authorities (+4.1%) saw a reduction in Settlement. Maps 1a and 1b below illustrate which district authorities and which shire counties have seen an increase and which have seen a decrease in their Settlements between 2006/07 and 2016/17. Map 1b shows that Cambridgeshire was the only shire county that saw a fall in grant (-0.9%). All three shire districts in the North (Cumbria, Lancashire and North Yorkshire) benefitted by an increased Settlement. Despite this, all shire districts in the country saw a decrease in their Settlement. Furthermore, Map 1a shows that only eight of the 36 metropolitan districts nationally (22%) received a higher Settlement than in 2006/07 (six of these were in the North). However, unitary authorities fared better with 39 (70% of the total) having a higher Settlement. Only 13 of these were in the North, however. Since 2006/07, the population of England has risen by more than 3.5million people and the Settlement to local authorities has fallen by £990million over the same period. As a result, the Settlement represents a change in spending power from £373.43 per person in 2006/07 to £300.76 per person in 2016/17. Table 4 below shows how the per capita allocation has changed in the regions over the last ten years. London’s relatively large population growth (over 1million) and disproportionate fall in Settlement, has resulted in a per capita reduction of over £230. In the North, Yorkshire and the Humber councils are worse off by an average of £27.39 per person. In the North East, that figure is £19.55 and in the North West, £15.59. All regions saw a per capita decrease but in comparison to London and the North, some areas the fall was by as little as £2.88 (South East) and £5.01 (South West). The North West authorities of South Ribble (£28.92) and South Lakeland (£28.98) have the lowest per capita Settlement in the North. Meanwhile, Liverpool (£573.17) and Blackpool (£539.82) have the highest per capita Settlement. Responding to a local government request, the Secretary of State set out indicative figures to allow councils to apply for a 4 year budget, extending to the end of the current Parliament in 2019/20. This was designed to allow councils to formulate ways to translate this greater certainty into efficiency savings. Giving councils the option of longer-term funding Settlements is significant and is seen as an important step towards the financial certainty councils need to run high quality services. The Government forecasts the total funding available for council services to be broadly similar in 2019/20 as it is now. However, by 2019/20, indicative figures show that the LG Settlement to local authorities will be £13.9bn – a 22.3% fall on the 2016/17 Settlement. All local authorities will see a reduction in their Settlement on 2016/17 figures with the exception of the Greater London Authority (3.6% increase) and the Isles of Scilly where there will be no change. The combined indicative Settlement for the three northern regions stands at £4.3bn, a fall of 21.2%. The cost pressures, and reductions in the first two years of the Settlement, will mean that many councils will still need to find savings elsewhere, make significant reductions to meet funding gaps and may have to ask residents to pay more council tax. Indeed, allowing councils the flexibility to raise Band D council tax by the maximum of £5 or two per cent will help mitigate some of the additional funding pressures they face in 2016/17 and beyond. The offer of four-year funding Settlements, with council tax and localised business rates playing a more important role than RSG is a positive development. In the longer term, local authorities will hope that the move to full business rates retention is done in a well-considered and collaborative way and the presentation of the Settlement still includes the rather optimistic assumption that council tax base growth will be about 2% per year, however. Furthermore, with the ending of the transition grant the recipients will face sharp funding cuts in 2018/19. The publication of the final LG Financial Settlement shows that the majority of lower-tier authorities have seen a reduction in the Settlement they have received from DCLG as Government continues to address the deficit. However, most shire counties and many authorities providing upper-tier services have seen their allocation of funds increase on their 2006/07 figures. This and the indicative figures to 2019/20 suggest that local authorities will continue to face severe pressures on their budgets and therefore on the services that they provide to their residents.